Kenya safari lodges range from the very exclusive properties, luxury tented camps, five-star safari lodges, to low priced campsites for the budget traveler. Here are some of the best Masai Mara lodges, Amboseli lodges, Mount Kenya lodges and safari lodges in other destinations around the country. 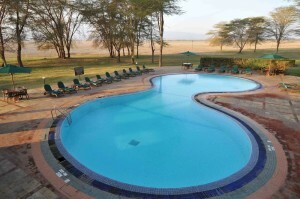 It is located 300 kilometers from the capital – Nairobi, on the pristine riverfront of the Talek River. The lodge is designed to complement its surroundings and it’s an excellent destination for those seeking to experience the best African wildlife safari. Mara Simba Lodge has 84 guest rooms each opening into its own private veranda with unbroken views of the scenic Talek River and the surrounding plains. Luxury tents are also available. The lodge is designed to reflect the circular motif of the Masai manyatta (huts). It is situated in the Masai Mara National Reserve and offers spectacular views of the annual Great Wildebeest Migration. Mara Serena Safari Lodge has eco-friendly, spacious and secluded rooms each with a private balcony overlooking the wildlife rich plains. It was the first game lodge to be built in the Masai Mara National Reserve and it is situated in the direct path of the spectacular annual wildebeest migration. At the pinnacle of migration, the lodge is surrounded by thousands of wild game, providing a magnificent and memorable view for the guests without having to travel far. It is situated in the Oloolaimutia valley 230 kilometers southwest of the capital, on the furthermost eastern corner of the Mara. The lodge blends perfectly with its surrounding; the Masai people, fabulous wealth of wildlife, bird life, and flora. Mara Sopa Lodge has 77 standard rooms, 12 suites and 1 Presidential suite. Use the search below to search more than 115 Masai Mara lodges for the best price and availability. You’ll be able to refine your search, read reviews and easily book online. It is situated approximately 270 kilometers southeast of Nairobi in the heart of the Amboseli National Park. OL Tukai lodge has 80 luxury chalet-style twin rooms all with an uninterrupted view of the wetlands or Mount Kilimanjaro. The lodge is one of the best spots in the world to watch elephant. It is located on the foothills of Mount Kilimanjaro making it is an ideal holiday base for the adventurer wishing to conquer the mountain and enjoy numerous pursuits. Amboseli Sopa Lodge has spacious cottage style rooms with en suite bathrooms and private verandas. The lodge is situated in the Amboseli National Park and surrounded by acres of grasslands, patrolled by huge herds of elephants. Amboseli Serena Lodge offers 96 guest rooms, each with an excellent view over the vast African plains. Tortilis is an award winning, tourism’s lodge situated just outside the Amboseli National Park. The lodge’s tents are furnished with focus on rustic simplicity, unobtrusive beautiful design and attention to comfort without compromising the ecosystem. It has 17 large & Luxury tents; 9 with King-size beds, 7 with Twin beds and 1 Family room with 2 bedrooms. Use the search below to search Amboseli lodges for the best price and availability. You’ll be able to refine your search, read reviews and easily book online. To search Kenya safari lodges in Mount Kenya, see this page on Mount Kenya lodges. Use the search below to search more than 1500 Kenya safari lodges for the best price and availability. You’ll be able to refine your search, read reviews and easily book online. Enter the destination’s name on the field that says “Where?”.